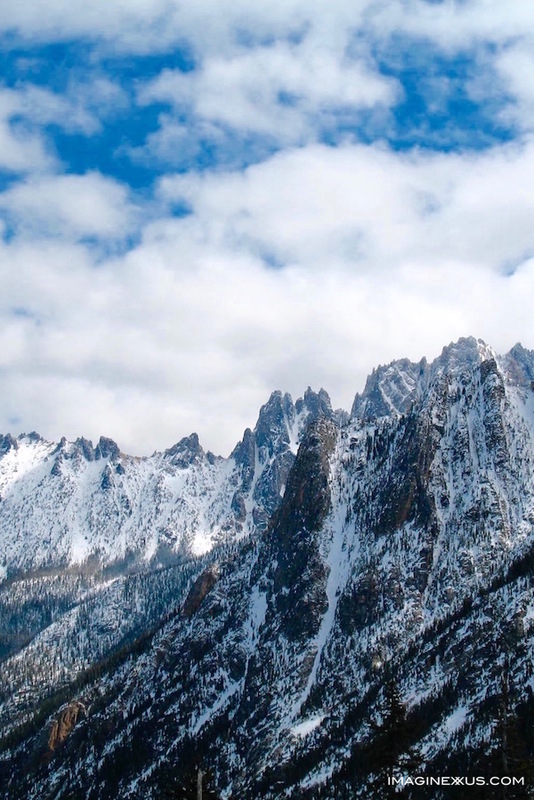 North Cascades National Park: A Well-kept Secret — . Which national park is this next to the Canadian border? If your answer is Glacier, you’re close, but about 500 miles too far east. The North Cascades National Park has equally stunning alpine lakes and hikes as its Montana cousin. Yet, it receives under 35,000 visitors annually or about 2.3 million fewer than Glacier Park. Its lower than average visitor count could be attributed to the facts that there are few park facilities and limited lodging options, other than campgrounds. Nonetheless, for those willing to rough it or even drive 50 miles for a day hike, the payoff is definitely worthwhile. A hike was unfortunately out of the question for us due to a recent storm. The trails were covered with a thick blanket of snow which made walking difficult without snowshoes. We may not have been able to venture from the parking lot, but nothing prevented us from admiring the craggy, jaw-dropping beauty that rivals any the Rocky Mountains, Swiss Alps or New Zealand’s Southern Alps have to offer. If you enjoyed this story in our series, you may also enjoy two other stories about the beauty of Washington around Lake Chelan or the Methow Valley. We also invite you to check out the books in our series.